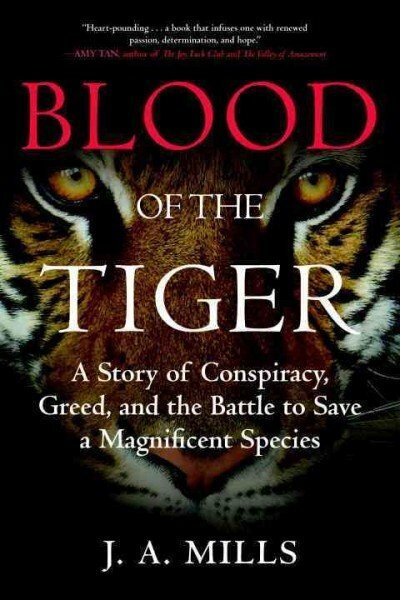 In the very first chapter of Blood of the Tiger: A Story of Conspiracy, Greed, and the Battle to Save a Magnificent Species, by J.A. Mills, we are introduced to the horrors of Asian bear farming and bile milking: bears kept in cages no larger than the animal itself with tubes surgically implanted into their gall bladders to drain bile for use in Traditional Chinese Medicine (TCM), fueled by an apparently limitless demand in China and East Asia for such products which include bear paws, rhino and elephant horns, and various parts of tigers, as well as soup and wine derived from the bodies of tigers! The author colorfully describes her first encounter with a bear farm as “Dachau for bears . . .” [p28] and she makes a promise to herself to do something about this travesty. This is a promising start, but alas the book declines from this point forward into a tedious and rather poorly-written narrative that is part-memoir and part-manifesto, long on the reporting of meetings and events in the narrow sense – i.e. the author attended the meeting/event and recounts it purely through her eyes – and far too short on the articulation of the wider theme outside of her parochial context. The book jacket proclaims it “heart-pounding” – from a review by noted author Amy Tan – but never once did I feel my pulse race over the long slog of nearly 250 pages that more than anything else encompassed a dull concatenation of conferences with the author ever shocked at her own naiveté and always surprised as events conspired to defeat her efforts to preserve wild tigers and outlaw tiger farming. Full disclosure: I obtained this book as part of an early reviewers program, so I felt obligated to read it through in order to fairly evaluate it; I kept reading long after I otherwise might have abandoned it. That this is not a well-written book should not overshadow the cause Mills is championing. For those who believe that Traditional Chinese Medicine is just bunk, it turns out that tiger bone and other TCM products do contain certain potentially salubrious substances. At the same time, in the twenty-first century the far superior pharmaceuticals of modern medicine have virtually replaced the need to hunt wild animals on the verge of extinction to feed the demand of the superstitious chasing traditional remedies. And this demand continues to grow exponentially. Bear and tiger farms have been introduced in China and elsewhere in Asia to satisfy this demand by “farming” captive animals to turn into parts and distill into wine for an eager audience. Mills and her allies argue convincingly that apart from their inherent cruelty, such farms perpetuate and exacerbate the problem of the threat to endangered species both because these blur the line between legal and illegal trade, further enabling poachers, and because many Asians still believe that the wild product is superior to the farmed one which the wealthy among them will pay a premium to obtain. Due to the stubborn refusal of China to outlaw the use of exotic animals in the TCM market, there has been an explosion of poaching: in faraway Africa this has resulted in the decimation of vast numbers of rhinos and elephants for the cherished ivory in their tusks, thought to be an aphrodisiac. Much of Blood of the Tiger details the struggle between those committed to protecting wildlife and the Chinese government, which officially decries poaching but actively cultivates the tiger farming that fuels the demand. Throughout the narrative, Mills complains about how misled and naïve she has been, how poorly she has misjudged people and policies, how hopeless her efforts seem to be. Reading this, I often wondered: did she ever do any research? Did she ever seek the advice of others? Was she really mature enough to take on this fight? In the “Epilogue,” Mills loftily states that “. . . this story isn’t about me . . .” [p233] but clearly to anyone who has read this volume, it certainly seems to be. Despite the many weaknesses of this book, I did manage to learn much about the demand for TCM products and how this jeopardizes wildlife across the continents. Fighting tiger farms is a just cause and I am now a firm adherent. Mills has indeed dedicated herself to saving tigers in the wild, through her work with TRAFFIC – the wildlife trade monitoring network – as well as World Wildlife Fund, Conservation International, and Save the Tiger Fund. She cannot be faulted for her commitment. Still, it is unfortunate that such an important story as this is told through such a weak narrative. If I will not go so far as to recommend this book, I will encourage readers to explore this topic further by other means and to add their voices to those who loudly demand that such dreadful practices as tiger farming come to a swift end in our time.